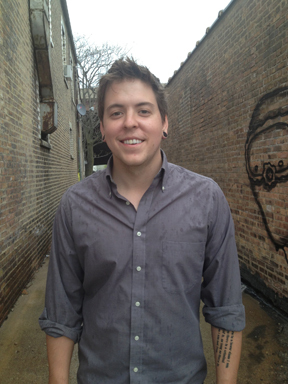 Question asker Ryne Holmquist has spent many hours traversing the Dan Ryan Expressway from Chicago to Northwest Indiana. 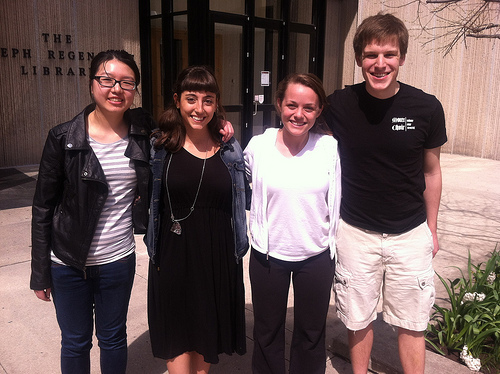 Our University of Chicago team from right to left: Alice Ye, Begum Cital, Samantha Brown, Sam Brandt. Aerial shot of the newly constructed Dan Ryan Expressway, 1960s, from Chicago Transit Authority. Pretty swanky, huh? When the first section opened in 1961, the Dan Ryan was the widest and busiest highway in the world. Map showing initial route and final route of the expressway, with 1950s census data. 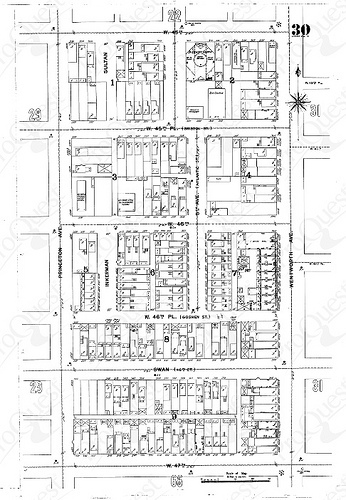 Sanborn map of 46th & Wentworth circa 1895. This area was demolished for the expressway. If you’re personally familiar with Chicago’s Dan Ryan Expressway, your appreciation for this story will greatly improve if you stop reading for a moment, visualize your last trip and consider some stats you probably never compiled. Maybe you never counted the number of lanes (there are 14, counting both local and express traffic), or you missed the fact that — all told — there are 62 ramps on the expressway. And even if you were driving alone, you had a lot of company; each day, more than 250,000 drivers zip along the 9-mile long stretch, which moves south from Roosevelt Road to 95th Street. Come to think of it, maybe you’d be impressed even if your tires never touched the expressway’s pavement. What did the Chicago South Side look like before the Dan Ryan Expressway? It’s a broad question to be sure, so it helped to know that Ryne was particularly interested in why the expressway was constructed in the first place, and a little about whether the area’s racial makeup changed. And here’s where we — four University of Chicago undergraduates — step in. We addressed Ryne’s questions by reading city archives, poring over historical maps and collecting relevant photographs. We also talked to people who recall the days before the Dan Ryan’s arrival, and we also hoofed it around several South Side neighborhoods. The skinny is that the South Side changed forever after the Dan Ryan’s arrival, but maybe not entirely because of the Dan Ryan itself. Why the behemoth in the first place? The expressway was originally called the South Route. In 1961, it was renamed after Dan Ryan Jr., the former president of the Cook County Board of Commissioners and a strong proponent of expressways. When it opened in 1962 the Dan Ryan promptly became host to shenanigans. We learned some of these accounts from Andy Plummer, a transportation historian who documents the Cook Expressways on his website. Plummer&apos;s got a lot of personal history with expressways, too. He’s worked on studies concerning the Dan Ryan (both before and after construction), and his father was involved in planning many Chicago expressways. 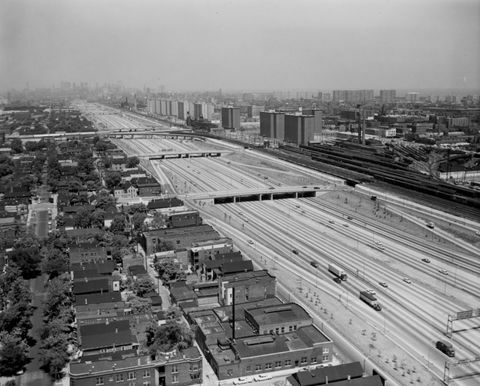 Before the Dan Ryan, Chicago had already built the Congress Expressway (1955) and the Kennedy Expressway (1960). "The motivation for the South Route was the same as the Northwest and Congress," Plummer says. "And that was to have a freeway system that served all of the city of Chicago and that focused on the downtown." This was the era of post-World War II renewal, a time when city planners, politicians, and government officials believed a superhighway would protect the downtown area’s economic vitality. It was part of an urban renewal movement meant to revitalize inner cities, all while accounting for Americans’ growing infatuation with the automobile. And with superhighways cropping up in Los Angeles and New York City, Chicago felt the pressure to catch up. How’d they manage the alternatives? “The city was still enamored with the idea of using Lake Shore Drive as their superhighway system. 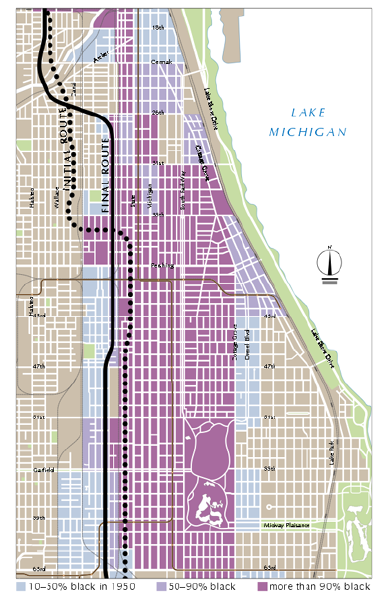 We should note that the Dan Ryan’s final route took more than a decade to sort out, but when all was said and done, the expressway did mark a division between the predominantly white neighborhood of Bridgeport and the expanding “Black Belt” neighborhoods to the east. Chicago’s long-standing racial segregation is infamous, but did the Dan Ryan create racial boundaries or reinforce them? Available maps and data can shed light on this. In 1940 the highest concentration of blacks stretched along the “Black Belt,” which spanned south from 31st to 60th, and went east from the Chicago and Rock Island Railroad tracks to Cottage Grove Avenue. By 1970, the boundary between blacks and whites had shifted several blocks west, along the Pennsylvania Railroad and encompassing the area now occupied by the Dan Ryan. But Dennis McClendon’s map, which incorporates data drawn from the 1950 census, suggests that blacks were moving west before the expressway was finished. Note the light purple areas that show blacks’ presence just north of Garfield Avenue. This means if the Dan Ryan was a barrier, it wasn’t a very effective one — at least south of Bridgeport. Dominic Pacyga in Chicago: A Biography argues that other barriers — such as political power, street gangs, railroad viaducts, and railyards — posed greater obstacles to blacks&apos; expansion into white neighborhoods. In other words, Bruce says, the expressway "helped expedite the exodus of the white community from the Southwest Side." Did the Dan Ryan arrive without a fight? With so much change in order, it’s a fair question to ask where the neighborhood itself landed on the issue of the looming construction. Compare this to what happened during the 1970s, when Chicago was pushing for the Crosstown Expressway (never built). There was more opposition this time, Bruce says, because people didn’t want to give up their homes. Plummer sums up the positive atmosphere regarding superhighway building before the Crosstown Expressway proposal. Archival photos in the Encyclopedia of Chicago and the Chicago History Museum show properties were eaten up to make space for the Dan Ryan. Bruce tells us that some buildings were actually relocated. But this didn’t happen often, as many of these properties were run-down residential buildings and churches. But what effect did such displacement have on the South Side&apos;s peripheral neighborhoods, the ones not directly along the Dan Ryan’s path? Our sources suggest that the South Side’s economic decline cannot be attributed directly to the expressway. Sanborn Fire Insurance Maps (compiled by student Sam Brandt) suggest Plummer&apos;s got a point. Neighborhoods across the South Side had been home to a diverse mix of industrial giants, including the stockyards. These giants, though, weren&apos;t slain by a behemoth expressway alone. In cases like this, it’s not what’s cutting through the neighborhoods, but the businesses around them that determine their character. Following World War II, the Dan Ryan continued a development trend that major cities were in love with: creating miles and miles of superhighway systems to hustle more people downtown. Though an important piece to Chicago’s urban renewal plans, the Dan Ryan did not play a critical role in altering the South Side’s post-war landscape. For example, the fact that it was built adjacent to the Chicago and Rock Island Railroad shows that planners considered existing neighborhood layouts. Ultimately, the Dan Ryan did integrate itself into the daily bustle of South Side residents, but it wasn’t always an easy fit. We talked to Jay Wolke, whose photography collection, Along the Divide, showcased life and death along this expressway during the 1980s. Perhaps he sums it up best. He says he never looked at the expressway as just an object. It met a cultural need, he says, and that means it’s a human subject. “This is a piece of engineering that separates and yet combines communities,” Wolke says. “It has a kind of dynamic where you can either be a part of it or you can be separated from it. It is a very dynamic system that we call this Dan Ryan Expressway."